Dinosaur Parties in Dundee We come to you! Animal Man’s Dinosaur Encounters provide the best Dinosaur Parties in Dundee. It’s a great show, with loads of fun. Our Giant T-Rex Barnie is the star of the show and will make your little one’s birthday party one to remember. It’s not just a costume dinosaur, it’s a T-Rex animatronic, so it’s like nothing you have seen before. Our Dinosaur Parties in Dundee is presented by Kevin our Dinosaur Wrangler who has 15 years experience in children’s entertainment so it’s going to go down a treat. Barnie arrives in a big horse box and makes a huge entrance. We’ll have the kids super excited and then play games and interact with Barnie. Kevin our Dino Wrangler does a 10 minute party intro, and sets the kids up for a massive surprise when Barnie walks in. We also bring a snake, bearded dragon lizard, tortoise and rat, and finish off the party with some animal handling and interaction. The Dino Party from start to finish is 1 hour and 10 minutes. It’s new, fresh, and super exciting. Forget clowns, magicians, crafts parties and character parties, you want to have the Coolest Dino Party for your little ones next big day. It’s easy to book and we take all the stress away from you, so you can sit back and relax, or get the food on for the little hungry party goers, who will be delightedly hungry after all the fun. It’s very easy to book, all we need is a date and venue address and we can check dates and get you booked in the diary. You can email animalmansminizoo.org.uk or call Kevin on 07957-382-580. 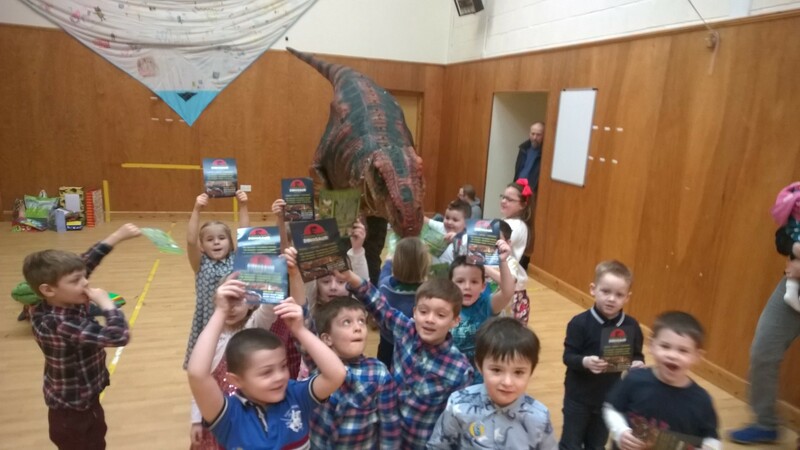 Our Dinosaur Parties in Dundee is something new, and something most people haven’t seen, so if you want an original party get in touch. Hey Gillian, I have send you an email. Hi Lorraine, I will email you now with prices and details. Wondered if I could have a price and details of this please? Hi Natalie, sorry we are fully booked for the 6th of May. Would the 7th be an option? Can you please let me know about prices? Is 13th of May 2017 free? We are on glenrothes. Can you provide costings and availability for sunday 9th April for my sons 3rs birthday party. We are near Glenrothes. Hey Alan, thanks for your enquiry, I’ll email you now. hiya kevin, I wanna book a party for me and my friends. Is there an age limit? Id love to hear from you. hi there, could you possibly send me some information about the dino party please. it for my sons 5th birthday on the 24/6/2017 if you have space available. Hey Sammy, I’ve send you over an email now. Hi can you let me knowing your available on the 9th or 10th of September the price of a dino party please. Could you provide me with prices please. I would be looking to book for a party in Dundee on the 18th nov.
Hi there please can I have prices for a Dino party please for Saturday 7th April in Dundee?